A unique excursion on an island with unsual scenery, from a snow-capped volcano to a beach spangled with rock formations, and on to heathland. Grundafjörður, the Snæfells volcano from "Jorney to the Centre of the Earth"
We leave Grundafjörður and travel through numerous fishing villages nestling along the coast to the famous Snæfellsnes volcano, with its over 1,400 metre-high, ice-capped peak: a contradiction in terms, immortalised in Jules Verne's timeless "Journey to the Centre of the Earth". In addition to this peak, which is one of the country's areas of major geological interest, the region also boasts other important mountains and volcanos. We will stop at Djúpalónssandur for a short walk along the pebble beach washed by the Atlantic Ocean to see the strange rock formations all along the shore. The enchanting landscape is enhanced by the numerous, fascinating, mysterious legends of this region. Our coach continues for a short trip along the cliffs of*Lóndrangar, the two volcanic basalt pinnacles of which are often called *Iceland's Twin Towers**. We finally arrive in the fishing village of Arnarstapi, immersed in an impressive landscape of lava formations inhabited by a large variety of birds. 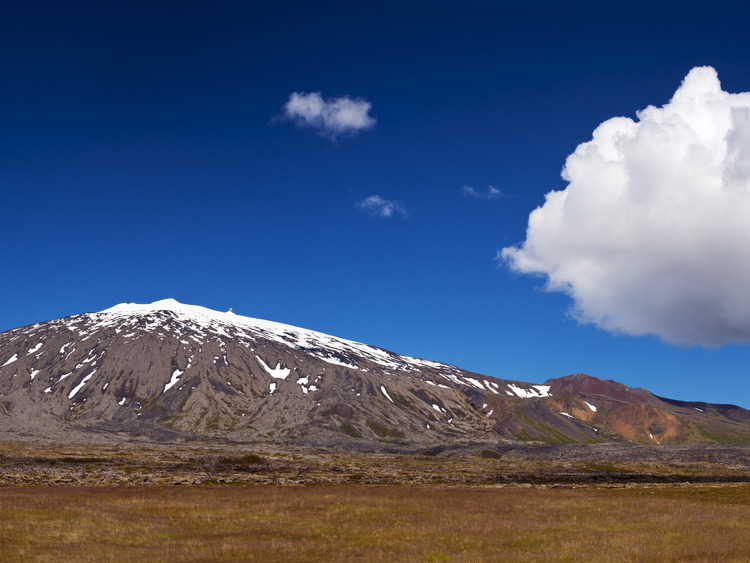 We will be free to enjoy the beauty of this place before boarding our coach once more to set off for Búðir, with its beautiful surrounding landscape of lava and one of the few yellow sandy beaches in Iceland. We have time to explore the area and visit the Búðakirkja, an 1850 reproduction of the first tiny church built in Búðir in 1703. Finally, we set off towards the north coast of the peninsula and cross the Frodarheidi heathland before returning to Grundafjörður.